Bloody Mary Battle, Online Pharmacy and New Faces at BLVD! Greetings from Boulevard Vet! Hope your spring has been going well and here’s hoping it gets a little drier soon. We’ve got some cool fundraisers on the horizon we wanted to let you know about and some new staff to introduce. 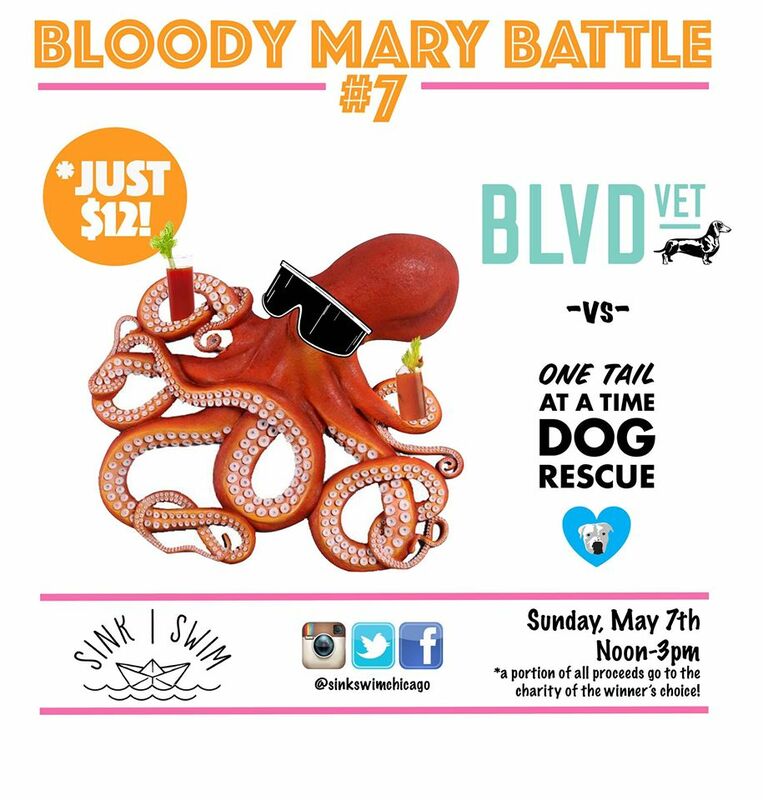 This Sunday, May 7th, I (Dr. Dylan) will be participating in a charity-focused Bloody Mary Battle hosted by our friends down at Sink|Swim! If you haven’t been there for one of these challenges (and brunch) you’ve got make this one—it’s the last one of the season and I want it to be the best. My opponent in the challenge will be Heather Owen, the Executive Director of One Tail At A Time, an awesome Chicago shelter organization that we work with frequently. We’ve each come up with our own signature recipe. BLVD's is dubbed “Dr. Dyl’s Dill-Infused Liquid Cure-All” and I feel that makes it a contender right off the bat. The public (you) tries one of each Bloody Mary ($12 gets you both) and votes for which they thought was best. The winning team gets to donate a portion of the winnings to a charity of their choice. If BLVD Vet wins, we will donate our winnings to our vanquished foe, OTAT. So, come on down, hang out with our crew and support a great cause. BLVD Vet will also be supporting two great Logan Square neighborhood groups: local publisher The LoganSquarist will be having their fundraiser Thursday, May 11th, at the Stan Mansion. Kelly (our Event Coordinator) is putting together a swanky $100 gift basket for their silent auction! June 10th we'll be doing the same thing for the Logan Square Preservation Society -- they're the ones holding the line against careless development in LS -- at their annual fundraiser, to be held at the Garage House mansion. In business news, we’ve recently partnered with a reputable online pharmacy called Vet’s First Choice to help give our clients more choice and convenience when it comes to getting medications filled. Most importantly, unlike many online pharmacies the manufacturer guarantees will still apply! Check out the online store here. It is also readily accessible from our home page at blvd.vet. They offer free shipping on any order over $50 or with Autoship selected. Let us know if you want any prescriptions switched over to this service! Next, we want to introduce our growing staff! 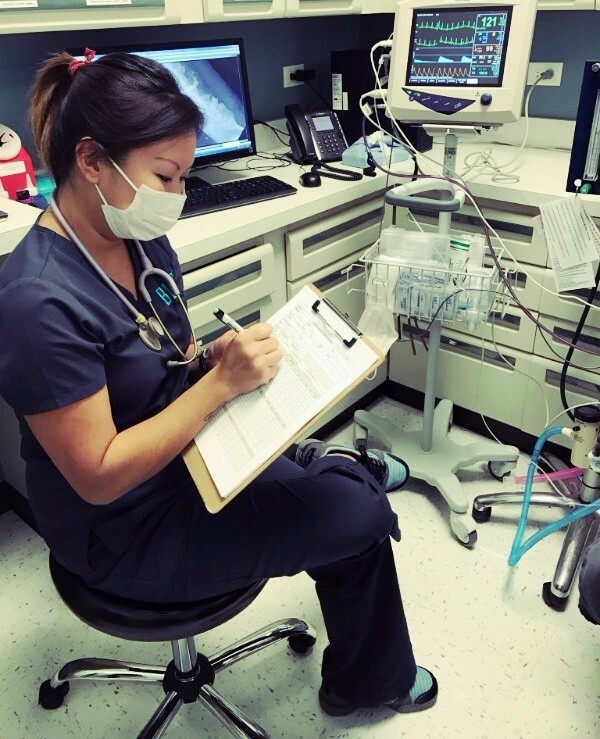 Colleen Trinidad finished classes at Fox College and sat for her boards to become a Certified Veterinary Technician—she passed! Congrats to her and we’re happy she’s starting out her career with us. Jeremy Akers is our very first full time Veterinary Assistant, joining us after a long stint in the grooming world. His animal handling skills and incredible work ethic have made him a hugely valuable addition. Charlene Russ is our most recent Veterinary Technician to join our ranks. She is highly experienced having worked as a tech in the West Loop the past several years. She is also currently taking classes to complete her Certification—hopefully later this year! Look out for them on our Meet the Team page as we add their bios later this month and please help us welcome them to the BLVD Team! Looking forward into May, we want you to know that both myself and Dr. Julie Geisler will be going on vacations this month (but not at the same time). Dr. Geisler will be out of the office from May 5th – May 14th. Then, when she returns Kelly and I will be leaving (for France!) and will be there from May 19th – June 3rd. We will be spending time in Paris, Provence and Nice so if anyone has any stellar recommendations I’m all ears. Hope everyone is having a great Spring so far and we hope to see you Sunday from 12-3pm down at Sink|Swim!